The Oloye Adenuga’s father Michael Agbolade Adenuga Sr. was a school teacher, his mother Juliana Oyindamola Adenuga (née Onashile of Okesopin, Ijebu Igbo) a businesswoman of royal Ijebu descent. A man with humble beginnings, he received his secondary school education at the Ibadan Grammar School, Ibadan . He worked as a taxi driver to fund his education while studying at University. He eventually graduated from Northwestern Oklahoma State University and Pace University, New York with degrees in Business Administration. In 1990, he received a drilling license and in 1991, his Consolidated Oil struck oil in the shallow waters of Southwestern Ondo State, the first indigenous oil company to do so in commercial quantity. He was issued a conditional GSM licence in 1999; after it was revoked he received a second one when the government held another auction in 2003. His telecom company Globacom spread quickly and started challenging the giant MTN Group. It launched services in the Republic of Benin in 2008, and has continued its spread across Ghana and Cote d’Ivoire, with more licences currently being prospected in other West African countries. He was named African Entrepreneur of The Year at the maiden African Telecoms Awards (ATA) on 15 August 2007. In 2009, Adenuga was detained for money laundering by the Economic and Financial Crimes Commission. Adenuga left the country and lived in London until the Umaru Musa Yar’Adua regime granted him a pardon. In 2012 he was made Grand Commander of the Order of Niger (Nigeria). In May, 2015 Adenuga made a takeover bid to purchase Ivorian mobile telecom’s operator Comium Cote d’Ivoire for $600 million. He is undoubtedly now one of the most recognisable names on the African continent. Born 59 years ago, Adenuga is a quintessential businessman who has made his mark so distinctly that world leaders speak glowingly about him. -Although his roots are in Ijebu-Igbo, Ogun State, he was born in Ibadan, Oyo State on 29thApril, 1953. 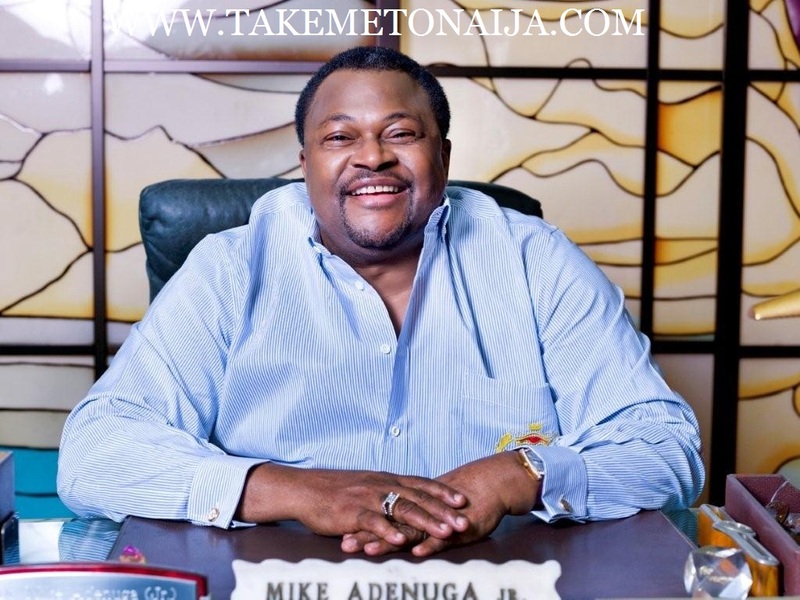 The Bull will turn 60 in about two months when his 682-paged biography Mike Adenuga: African Business Guru (written by award-winning Mike Awoyinfa & Dimgba Igwe) will be launched. Mike Adenuga was so big at birth that he was called John Bull in the hospital. -His parents: Chief Michael Agbolade Adenuga Snr. was a school teacher while his mum Chief (Mrs.) Juliana Oyindamola Adenuga (nee Onashile of Okesopin, Ijebu Igbo) was a businesswoman. She got married at the age of 17, learnt sewing and succeeded greatly as a dressmaker. Well-educated, she was made the Iya Alaje of Ijebu-Igbo and the Yeye Oba of Ijebuland. -He studied at the Ibadan Grammar School (IGS) before jetting out to the US to read Business Administration with a focus on Marketing. While at Ibadan, he was very impressed with the Cocoa House (then the tallest building in Africa) built by the Awolowo government. He dreamt of having such an edifice of his own one day, and today, we all know Mike Adenuga Towers. Located on Adeola Odeku Street, the 13-storey edifice which took him 13 years to erect dazzles with gold-on-granite finishing. You just can’t miss it! The first time I saw his building, I was mesmerized. It has a landing pad for a helicopter and was opened in 2004 by Atiku Abubakar. Now, don’t ask me if I want to build one too…lol! He also has a mansion in Ibadan and he named it ‘The Gold Digger’s Place’. -The billionaire is a descendant of Pariola, a very wealthy and influential female trader born in the mid-19th century. Apart from being the ancestor of the Adenugas, Pariola would also produce the Adetonas, the family of the Awujale of Ijebuland, Oba Sikiru Kayode Adetona. -Upon his birth, his father was so overjoyed at having another son that he named him after himself. His elder brother, Demola explained that he was not given the name because as at the time of his birth, the fad was to bear purely Nigerian names. Otunba was the last child so his father took the opportunity to name him after himself. He would later die in 1993 in a car accident and his son did a superlative re-burial for him in 2005 with one of the most expensive coffins on earth. -While at IGS, he and his brother (Demola) were nicknamed ‘Ad Belly’ for their huge stature and protruding bellies. Both used to cross the Ogunpa River (which they called River Jordan) whenever they felt like sneaking out of school. They took the huge frame after their parents. Demola was more of his dad while Mike took everything, including his business skills, from his mum. As a child, and under the supervision of his mum, he hawked goat feed, and picked up the street wisdom that came with it. -Although Mike was more fashionable and even introduced his elder brother to the latest wears and perfumes, he still had to seek his help when it came to academic matters. -His mother had always been quite cautious about the adventurous and somewhat rascally nature of Mike. She really did not want him to go abroad to study & wanted him to join his brother who was studying biochemistry at the University of Ibadan. She reported him to a commissioner of police in Oyo State then but he encouraged Madam Juliana to let him go, perhaps, that was God’s plan for him. Worefa, his mind was made up. He was leaving Nigeria. And he left. When he also wanted to dabble into the very risky oil and gas sector and do what no other Nigerian had done before (drill oil), she made her fears known again thinking it was a senseless gamble. He calmed her down, and he would later announce to her excitedly: ‘Mama, we found oil!’ Today, his Conoil PLC is the largest indigenous oil production company in Nigeria operating six producing oil blocks in addition to owning ¼ of the Nigeria/Sao Tome Joint Development Zone Block 4, which has been proven to have almost one billion barrels of crude oil and about one trillion cubic feet of natural gas. Some people, like Dele Momodu, his mentee, believe Adenuga is actually the richest man in Africa. I must chip in here that in November 2011, 500 pensioners of Conoil engaged Adenuga in a tussle over unpaid pensions. #AneyeToto! -There is something about Adenuga that caught my attention: he would never disobey his mother. The late matriarch had enormous influence over her son, and the only time he went against her directive was the oil business issue. Friends say that whenever there was any disagreement, just mention his mother’s name, and he would mellow down. Such was the degree of tremendous respect he has for his mother. #Iyaniwura. -While studying in the 1970s, he had to survive and raise his school fees by working as a security man and a taxi driver, an extremely dangerous job for a blackman in the crime-ridden boroughs of New York -Staten Island, the Bronx, Brooklyn and Queens. His curiosity in Nigeria where a little Mike tugged the steering wheel with drivers amused them, and they taught him how to drive. This, he made use of as a means of survival. If you are thinking he drove those shiny yellow New York cabs, you are wrong. He drove an unregistered jalopy and had to ply areas where the police would not harass him. It was as a taxi driver that he met a man named Dele Giwa, who was also surviving as a cab driver. Giwa would later be blown out of existence in 1986 by Nigeria’s first parcel bomb. As a student in America, Adenuga suffered and laboured for months as he was not getting a kobo from home. He knew the consequences, faced the challenges and triumphed. He might not have finished schooling without his extra efforts. Did I tell you that he also worked as a waiter and a mortuary attendant in the US? Yes, he did. And by the time he came back to Nigeria then, he was with a bushy beard. #HustlingThins #IgboroORerin! -As a student in North Western Oklahoma State University, the school slogan was ‘Ride With Pride’, and he would later transform it to become ‘Glo With Pride’, when he launched Globacom. -After graduating, he headed straight for Naija, and without wasting any time, started utilizing all he learnt. He did not seek any paid employment but took the risky road of entrepreneurship. He took over the management of the family’s small sawmill in Ogun State and was also selling removable car stereos at the same time as he had noticed the problem caused by the rampant theft of car stereos. Civil servants awash with the Udoji Commission salary raise were buying cars but thieves would do away with the car stereos. With Adenuga’s stereos, people could then park their cars, detach the stereos and go to bed. Simple. And he made cool cash. If you want to make money too, look around you, find a pressing problem and create a much-needed solution. -By the age of 22, he had delved into the business of commodities, general merchandise, construction, importation (of mainly sawmill equipment, tomato paste, wines, beer and textile materials (especially lace) made in Austria). Why is my mischievous mind thinking that good fabrics and chilled beer are integral components of an Ijebu owambe parry? Anyways, just saying…lol! -By 26, Michael ‘Aneye Toto’ Ishola was already a millionaire. Now, chill. At this point, some critics will take him up saying that he became fabulously wealthy by benefiting from the close and cosy links he had with Nigerian military dictators. Well, that’s not a rumour. Babangida’s oil minister, Professor Jubril Aminu came up with a policy to grant licenses to individuals and encourage private sector participation in oil exploration and exploitation. Otunba was one of the first beneficiaries of the Petroleum Act (MKO Abiola of Summit Oil was another). Upon getting his oil bloc prospecting license (OPL 113), Adenuga went straight to work in the South Western Niger Delta Region and in less than a year on 24th December, 1991, he struck oil in the shallow (offshore) waters of Ondo State in his first oil well (named Bella-1) becoming the first indigenous oil firm to do so. Other Nigerians could not take the risk, and had sold off their licences to expatriates. An incorrigible risk taker, he had hired an oil rig for $5 million BUT he recruited only Nigerian oil specialists to do the job (he has always been a patriotic man). Since then, he has never looked back. The first seed money that he used to start business was given to him by his late mum. It was a modest sum but he used it judiciously. #Iyaniwura. -With time, his fortune grew so amazingly that he was buoyant enough to sink over $100 million into his own oil prospecting and drilling company, the Consolidated Oil Company. This company, founded in 1990, is the very first indigenous Nigerian company to discover, drill and produce oil. And you know na, we are not talking of palm oil here….lol! Thus, his fortunes are based on a tripod: telecommunications, oil & gas and banking. He is also into real estate, food manufacturing & processing (butter, cocoa cake and vegetable oil), domestic & international market activities and aviation (not many know he is the owner of Southern Airlines). -When his mother died, he gave her a most befitting burial in Ijebu Igbo, Ogun State on 13th September, 2005. A carnival-like ceremony, it was stormed by former President Obasanjo who buzzed in in a helicopter (that man and effizy sha…lol!) and when he entered the church, no one else was allowed to come in except Titi Atiku Abubakar (wife of former Vice President Atiku Abubakar and WOTCLEF Founder). Other guests: Aliko Dangote and Femi Otedola. Governors of Lagos, Ogun, Taraba, Bauchi, Niger, Kaduna and Imo also gave a new definition to the Yoruba parlance of olowonshoreolowo (the wealthy always mingle with one another). Even IBB showed up at the wake-keeping. But the Awujale of Ijebuland, who is the Paramount Ruler of Ijebus was not able to attend because it is against the tradition for the Kabiyesi to lay his eyes on a corpse. His staff of office was placed on her hearse. Encased in a casket made of gold, Mama Adenuga was laid to rest in a marble grave. ‘I don’t really know may be N100 million,’ Ogunbiyi suggested. ‘That’s exactly how much I have in mind,’ declared Adenuga. “Now the question from Obasanjo’s emissary was curious and unusual, he thought, but nevertheless, he had no choice but to inform the man that he planned to donate N100 million, thinking the man would be very impressed. Wrong. Obasanjo’s cousin brought out a piece of paper and handed it to Adenuga. ‘Sorry sir, but Baba says you can’t donate less than that amount,’ the man had written. -Never far from the corridors of power, he was arrested in July 2006 by operatives of the Economic & Financial Crimes Commission (EFCC). Mobile policemen and security agents numbering about 70 were mobilized to arrest the titanic mogul. In a commando style reminiscent of the US Navy Seals, they stormed his Lagos residence, pulled down his gate with hammers, generators, welding equipment and other heavy machinery, and flew him to Abuja. He was questioned for some hours before he was released, then he visited the Aso Villa. What actually transpired that day, only Chineke knows but he was so traumatized and when reports were coming that he may be rearrested and prosecuted, he left for London and did not come back until a new government was in place. He has had his brushes with the law, and at a time, the Federal Inland Revenue Service (FIRS) sealed up his oil companies for allegedly evading taxes of about N89 billion. Some believe he, alongside other tycoons are stifling Nigeria’s development while some people sharply disagree highlighting his contributions to the economy. What do you think? Still on his elusiveness, Soyinka narrates his experience, calling him a magician: “I can’t remember when last I saw him or spoke to him. Adenuga has a vanishing habit. He would just disappear.” At a time, there was supposed to be a meeting with the Bull in London but WS never saw him and he left in anger. Soyinka continues: “All I know is that I see Globacom advertisement everywhere. I also know that Adenuga supports sports, especially football. I wish he could do more for the arts. I have sat him down once. I told him: ‘Listen, you have the money and the enthusiasm, but we have the ideas. Let’s sit down and work together and let us do more for the arts. He would agree, but I said, he would then disappear. He has this vanishing habit. My wish for Globacom is that they would do more for the arts. I feel envious about the amount Globacom is committing to sports. I wish I could get his attention sufficiently to do even half for the arts. If Adenuga is reading this, he should stop running away. He should come and sit down with me so that we can do something for the arts.” Otunba later apologized (sweet-mouth..lol) and they made up. -Stanley Ebochukwu, Editor-in-Chief of BusinessDay (I like that paper die! ) says: Adenuga is somebody one would call an enigma. You can’t see him, if you want to see him. If you call him, he can’t take your calls. But if he wants to see you, he would see you. And if he wants you to see him, you would see him. Most businessmen tend to behave that way, because of the fear of people. -But if you think that is all about his disappearing acts, listen to what his fellow billionaire and Africa’s richest man, Aliko Dangote has to say about him: “I haven’t seen Mike for a very long time. I don’t have his number. I don’t know where to reach him. Even if you put a gun on my head and you ask me to lead you to Mike, I will never be able to. He is just nowhere to be found. Mike is a mystery to me.” The most surprising thing about this is that both of them have their residences on the same lane in Victoria Island. Amazing! -In another piece written by Mike Awoyinfa and Dimgba Igwe (I say the finest authorities on him), they narrate the words of one of Adenuga’s closest associates, Dr. Rafiu Ladipo: “He takes risks and he is ready to stick it to the end. He never gives up. Is there anything he touches that doesn’t turn into gold? He is such a determined person. He is always charging like a bull. When he wakes up in the morning, he thinks about his business and nothing but his business. He is not a socialite. You can never catch him attending parties. He works Saturday, Sunday, Monday, Tuesday, Wednesday, Thursday, Friday, Saturday, Sunday…He goes on and on like that facing his business.” Reminds me of another billionaire in Nigeria who works for 18 hours a day. Yes, you guessed right. -Well, just like a raging bull after a doomed matador, he didn’t stop his entrepreneurial triumph in the oil industry. In February 1990, he made a bold entry into the banking industry. He floated Equatorial Trust Bank (ETB). And later on, he launched his biggest and most ambitious project ever, Globacom which drastically crashed the rates of phone calls (I still find it very hard to forgive MTN for calling at N60 per minute!). -His calm mien belies an underlying aggressiveness and relentless determination of a tycoon. He can also be very ruthless with lazy and incompetent workers (if na you too nko?). According to Mohammed Jameel, Glo’s Chief Operating Officer (COO): ‘Two, three days after joining Globacom, he called me to his office. The first day I met him, he was very quiet. And I didn’t want to say anything. I just watched him. Of course, a lot of my colleagues were there. I was very impressed with him. He was planning to launch the brand Globacom. I saw in him a lot of passion. I saw in him a lot of commitment. I saw in him a lot of vision. He wanted the brand to succeed. And the kind of figures he was talking about in terms of subscribers and putting in infrastructure did really surprise me. Jameel continues: ‘He is a very successful entrepreneur who can turn any venture into good. He is a very, very aggressive manager. He is a very target-oriented manager. He is a manager who has a huge vision. He always thinks big. If you are hearing him for the first time, you would think this man is just joking. But he is not joking. Whatever he says, he is determined to achieve it. He is very passionate about whatever you do with the business you do for the brand. Even things like branding the street, he gets into the details to get things right. And he doesn’t take instant or spontaneous decisions. He has to think it across. He doesn’t take decisions on his own. He respects the views of others. (something a lot of people have to learn, especially those with coins and small small change who at the slightest opportunity, insult others who disagree with them. I added that ajasa myself!). He calls all of us and gives us the opportunity to air our own views, share our thoughts, share our ideas. He also makes his own input and we end up coming up with a collective decision. He lends his ears and mind to whatever is being talked about; irrespective of whether it is the COO or the person employed in the customer service.” #Gbam! Una don hear am again. Shey e ring abi make I redial am? #Lmao! -He actually saved the National Oil & Chemical Marketing Company (NOLCHEM) from the jaws of death. He bought it and transformed it into what many of us now know as Conoil Nigeria place, one of the most profitable entities in Nigeria. NOLCHEM was the first indigenous petroleum products marketing company, and the current Oyo State Governor, Senator Abiola Adeyemi Ajimobi was a Managing Director/Chief Executive Officer, he joined in 1979. -He is divorced from Fola, his first wife and the court awarded him the custody of the children and even the pregnancy Fola was carrying at that time. She was immensely pained by the court’s judgment. Today, he is married to the delectable Joyce Titilola Adenuga (nee Adewale) (see pictures on our website). Okay, there is an interesting story here. She had come for a job at Devcom Merchant Bank owned by Otunba when he was enchanted by her natural beauty and endowments. According to Adenuga’s early friend, associate and fellow IBB boy, Orji Uzor Kalu, he and Otunba had a slang for heavily-endowed women: ‘Burkina Faso’, with Burkina standing for the heavy ‘fronts’ and the ‘Faso’ for the superloaded ‘rears’. #StopRollingYaEyes,AreYouALearner? LOL! Adenuga did not prefer women with Burkina but remained ‘Fasoless’ (chai! Burkina Faso don suffer…lol! #AFCON). Baba prefers the complete package. Otunba was titillated by Miss Titi, and today, the rest is history. 3. Tunde ‘Paddy’Abolade. A car freak, he is the Group Executive Director, Globacom. He sure cherishes the limelight. While cruising out of Awolowo Boat Club in his black Porsche Carrera, he once gave out a sum of N5,000 to a physically-challenged beggar. 5. Belinda ‘Bella’ Olubunmi Ajoke (got married to Jameel Adetokunboh Disu in a fairytale wedding in April 2010. The first time they met, she introduced herself as ‘Bunmi Marquis’, and did not reveal her identity as Otunba’s gal), she is also the Group Executive Director, and one of his buildings, Bella Place on Ligali Ayorinde Street, Victoria Island Extension was named after her. He did name a lot of things after her. Once obese (runs in the family), she said she was able to shed the excess fat because of the tenacity she learnt from her dad who used to call her Benbe (chubby). She says he doesn’t joke with his exercises, and hits the gym by 1.am everyday, he used to play squash a lot but stopped after an accident. She entered university at the age of 14. But there is one thing he does not do to his children: over-indulge them. He taught them to be hardworking and trained them to use their brains and not rely on anyone. His daughter, Bella, very much attests to this. And with all his towering wealth, his friends describe him as a shy and humble personality, and would bow down to most people while greeting. -With Orji Uzor Kalu, former Abia State Governor, they handled government contracts, did general merchandise and were into arms deals & oil trading. Now you understand Kalu’s outbursts against Obasanjo. Connect the dots. -Adenuga abhors politics but he is willing to support any government of the day. He likes minding his business but over time, he has been hounded by some politicians who feel he could use his enormous wealth to their disadvantage. A classic example has been given above. -Orji Uzor Kalu (also a Taurus) says of him: “We have been friends from a long time. I became Aliko’s friend right in the early ‘80s when I was a student at the University of Maiduguri. With Mike, our friendship started when he was living close to me on 6A Adeleke Adedoyin Street in Victoria Island, Lagos. This is where all of us came to become friends. Dangote and Mike were not close, but I was close to both of them. I was a kind of bridge between two of them.” Kalu was later rusticated from UNIMAID and had to sell palm oil on the streets of Maiduguri but that is another story for another day. For now, Iyaniwura is focusing on The Bull. -In December 1982, armed robbers attacked him in his residence and he sustained some bullet wounds. In a confused and tense atmosphere, an argument broke out among the robbers, with Adenuga still groaning on the floor and moaning in the pool of his own blood. A defiant robber said: “Let’s finish the job. We have to finish this job. We must kill him. We must kill him.” Then he pulled the trigger. What happened after is divulged in his biography. That experience left a lasting impact on him. He enjoys his ride over the best fleet that offers an exclusive sense of elegance with the boosted performance that is simply incomparable in the race of fleets. He likes to praise those collection of that is boosted with advance technology as well as effective interior design. Therefore, he likes to experience something different therefore like to drive in Audi A7 that is known for its stylish design. Has won numerous awards globally..
Adenuga and wife were said to be involved in a fraud scandals with Siemens in 2010 which lead to issues with EFCC.